If you don’t own a flat screen television (either LED or LCD TV) yet, you probably are planning to buy one. We have to admit that these screens look gorgeous. They keep getting bigger, clearer and cheaper as the months go by. And based from the recent article from Wired magazine, we can expect them to get even cheaper if the trend we’re seeing will hold true for the years to come. So how do these LCD TV’s get cheaper and cheaper anyway? The simple answer can be found on the machines that make the display panels. As time goes by, the size of sheets of glass that the machines can produce as display panels keep getting bigger. 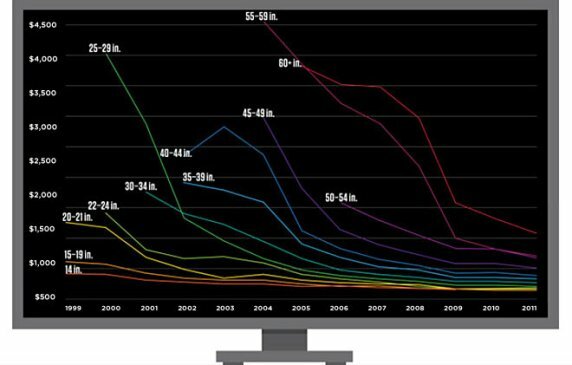 This increase in size is the most significant driver of production cost for the flat panel displays. In 1999, the glass sheet size produced by display-making machines is around 5 square feet but after 12 years, that figure jumped to 124 square feet for 2011. If you haven’t bought an LCD TV yet and are planning on buying one, you probably will be able to afford those humongous displays you thought were too expensive today in the not so distant future. I suspect that my 32 inch Samsung LCD TV will be looked down as too small by then with 55-inch size LCD TV’s becoming the norm. So the question is, will you buy now or hold off until prices go even lower?